Boston Mayor Martin J. Walsh (left) and City Councilor Tito Jackson (right) at a debate moderated by the Globe’s Adrian Walker (center) at Hibernian Hall in Roxbury. Mayor Martin J. Walsh and his rival, Councilor Tito Jackson, clashed Wednesday over which of them can best lead Boston, who intervened first to address the race crisis at Boston Latin School, and who has the best plan to help the city’s struggling communities emerge from the shadows of the downtown skyscrapers. For Jackson, it was the first opportunity to face Walsh one-on-one in his underdog campaign, and he quickly pounced, declaring that Walsh had failed the city during his nearly four years in office. In response, Walsh ticked off his administration’s accomplishments and his strong connections with city residents, saying he has dedicated himself to making the city better since he took office in 2014. The exchange, before a lively and engaged audience, signaled a shift for the mostly sleepy mayoral contest. It came days after the campaigns traded snarky letters over the number of debates prior to the Nov. 7 election. Jackson is demanding four; Walsh, two. Another debate is set for WGBH TV and Radio on Oct. 24. 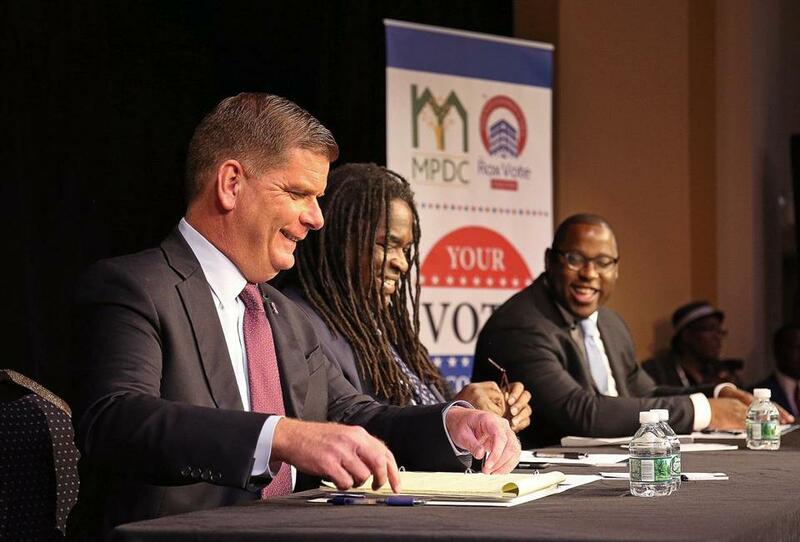 The setting for Wednesday’s hourlong debate was Hibernian Hall in Roxbury, with moderator Adrian Walker, a Boston Globe columnist, sandwiched between the councilor and the mayor. The debate, sponsored by RoxVote Coalition, was aired on BNN and streamed on the Internet. In last month’s preliminary election, Walsh led Jackson by more than 30 percentage points. On stage, each man came prepared with his own data, scanning prepared notes throughout the debate. Jackson spoke passionately as he laid out his critique of the Walsh administration and his case for change. Walsh, more muted in his tone, was more methodical in his presentation, defending his tenure and work to improve the city’s race relations. Most prominently, the two men disagreed over who moved first to address the controversy over racism at Boston Latin School, raised by two students who said the school did not respond quickly to their allegations of racial insensitivity by other students. Jackson said he brought the issue to Walsh, who the councilor said did not quickly address the matter. “He actually punted on that issue . . . and there was a crisis,” Jackson said. Walsh said that he would have acted sooner if he had known of the crisis earlier — a claim that drew jeers from the crowd. On the state of race relations, Jackson said 40 percent of Walsh’s support came from people of color, but that those communities “have not been well served” by the mayor. When Walsh was asked whether black Boston has the political clout it needs to be effective, he responded by lauding the black politicians in the hall, calling them out by name. “We need to build up the ranks throughout government,’’ the mayor said. He noted that half of his Cabinet are people of color, and he received cheers when he named John Barros, his economic development chief and a longtime leader in the Dudley Square area. The mayor also said that 40 percent of the people he hired for city government jobs are either black, Latino, or Asian. Walsh smiled when Jackson noted one other job that could be filled by an African-American — the mayor’s office — if voters supported him on Nov. 7. During the course of the debate, the two touched on several other issues, such as public safety, affordable housing, economic development, and public education. Jackson accused the mayor of trimming funding from programs targeting students with autism or suffering from trauma. “I would say the Boston Public Schools are moving backwards,” said Jackson, as he promised more funding for the system. Walsh acknowledged in the debate that the school system has a lot of challenges, but he stayed focused on his achievements. He said his administration has made record investments in the district, including more money for special education and $1 billion for school facilities. “There’s a lot of good things happening in Boston Public Schools, though we do have a lot of work to do,” Walsh said. On the topic of economic development, Jackson said he would abolish the Boston Planning & Development Agency to make development more people-focused. If elected, he said, he would establish a disparity study to address income inequality. While the city’s population has grown by 30,000 over the past four years, Walsh said Boston has also picked up 60,000 new jobs. Jackson also challenged the mayor’s decision on General Electric, accusing the administration of giving away incentives and leaving Bostonians with the bill. But Walsh shot back, noting, among other things, the $25 million the company promised to city schools. On the affordability of housing, Jackson said 80 percent of the housing being built under the current administration is geared toward more affluent residents. As mayor, he said, he would ensure that one-third of all new development goes to low-income households, another third to middle-income families, and the rest should be market rate. He would also create 1,000 units of affordable housing, he said. Jackson pushed for a permanent program for police body cameras and said the city needs a civilian review board that “has teeth” to investigate complaints against officers. The mayor said a permanent decision on body cameras would be made in the next couple of months, after officials analyze data from the yearlong pilot program that recently ended. He noted the department is moving to increase diversity through a revived cadet program and emphasizing diversity among the command staff. Outside, dozens of the candidates’ supporters waved signs while shouting “Walsh,” or “Tito,” across Dudley Street. Inside, spectators jeered statements by the candidates, shouting “not true,” or asking their own questions, often disrupting the proceedings. “I’ve loved every single day of this job, and I’m asking for your vote on Nov. 7,” said Walsh. Jackson, a 42-year-old Grove Hall resident, said he would fight to ensure that the economic boom seen in the Seaport would come to people of Roxbury, Dorchester, and Mattapan. Meghan E. Irons can be reached at meghan.irons@globe.com. Follow her on Twitter @meghanirons. Milton J. Valencia can be reached at milton.valencia@globe.com. Follow him on Twitter @miltonvalencia.